Beo! - Cad is ceannaireacht ann? Tréithe an dea-cheannaire atá á gcíorú san alt seo ag Ciarán Mac Aonghusa. Tá sé de mhianach ar údar éigin i bpobal na Stát Aontaithe ó thús, ceannaire a sholáthar in am na héigindála. An féidir teacht ar na tréithe sin a dhéanfadh an dea-cheannaire, nó an bhfuil aon chuma ar an scéal abhus go bhfuil a leithéid in aice láimhe in Éirinn? Bíonn ceannaire mór de dhíth in am na cinniúna, duine a bhfuil fís aige, duine a mhothaíonn an ghaoth stairiúil, duine a ghlacfaidh leis an dúshlán mhór mar ghlaoch ó na déithe, duine atá sásta a thodhchaí féin, uaireanta a bheatha féin, a chur i mbaol mhór, agus duine a bhfuil cumas cumarsáide den scoth aige. Anois agus Éire buailte ag an anfa gheilleagair, cuirtear an cheist, an bhfuil bua na ceannaireachta ag an Taoiseach Brian Cowen. Ach tá sé suimiúil ceist eile a chur, cad is ceannaire maith ann? Is fiú féachaint ar stair na Stát Aontaithe chun samplaí maithe a fháil. Ar chúis amháin nó ar chúis eile, is cosúil go bhfuil tréith amháin ag na Stáit Aontaithe i dtaobh na ceannaireachta: is ea go gcuireann sí duine ar leith chun cinn in uair na cinniúna. Is fíor gur tír í a théann ó mhaol go mullach go minic agus is tír í a bhfuil éagsúlacht iontach ag baint leis an chumas a bhaineann lena cuid ceannairí. 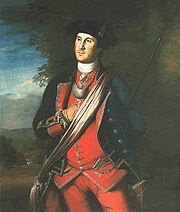 Ach is soiléir ó stair na tíre sin go mbíonn ceannaire ar leith le fáil inti nuair a bhuaileann géarchéim mhór í.
George Washington Téann nós na ceannaireachta siar go dtí bunú na tíre. Nuair a thosaigh an cogadh idir na trí choilíneacht déag agus impire Shasana sa bhliain 1775 bhí ceannaire míleata den scoth ag tástáil ó mhuintir Mheiriceá. Tharla go raibh a leithéid ina measc, mar a bhí, George Washington. 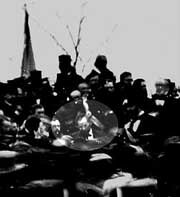 Bhí an tír faoi scáth na cogaíochta sular toghadh Abraham Lincoln. Bheartaigh cuid de na stáit ó dheas go scarfaidís ón Aontas dá gcuirfí deireadh leis an sclábhaíocht. Phléasc an cogadh. 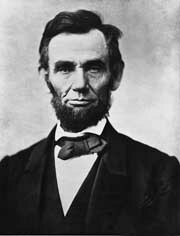 Cuireadh todhchaí an Aontais i mbaol, ach d’éirigh le Lincoln an lá a thabhairt leis. Tháinig an t-Aontas slán agus cuireadh deireadh leis an sclábhaíocht go deo. Cheap an tUachtarán Lincoln daoine fíorchumasacha ar an fhoireann a d’oibrigh leis. Éisteoir grinn a bhí ann agus deirtear gur chaith sé cuid mhór ama ag éisteacht le daoine. Duine tuisceanach a bhí ann. Cé gur tuaisceartach a bhí ann, thuig sé fadhbanna mhuintir an deiscirt. Bhí intinn ghéar aige fosta. D’éirigh leis tuiscint ghrinn a chur ar na ceisteanna móra polaitiúla agus míleata. D’admhaigh Lincoln a chuid earráidí agus chreid sé go dlúth gur chóir do cheannairí foghlaim óna gcuid botún. Bhí sé foighneach, ach nuair a thagadh an uair thráthúil, thapaíodh sé an deis. Bhí Lincoln móraigeanta agus flaithiúil nuair a bhuaigh sé, agus d’fhéach sé le guth a thabhairt do gach dream i ndiaidh na coimhlinte. Agus bhí misneach aige. Níor chuir cinneadh mór isteach ná amach air. Bua eile a bhí aige ná an chumarsáid. Thuig sé an tábhacht a bhain le fís a nochtadh agus le daoine a spreagadh. Meastar go bhfuil an óráid a thug Lincoln ag Gettsyburg, Pennsylvania i mí na Samhna 1863, ar cheann de na hóráidí polaitiúla is tábhachtaí dar tugadh riamh. San óráid stairiúil sin, chuir Lincoln síos ar an fhís a bhí aige, ní hamháin don tír, ach don daonlathas ar fad. Gaireadh Franklin D. Roosevelt ina Uachtarán ar na Stáit Aontaithe sa bhliain 1933. Bhí an Spealadh Mór (Great Depression) faoi lán seoil san am agus bhí an tír buailte go dona. Bhí beagnach tríocha faoin gcéad d’oibrithe na tíre dífhostaithe agus bhí teipthe ar na céadta míle gnónna ar fud na tíre. Thuig Roosevelt gurb í an ghéarchéim is measa í a bhuail an tír riamh. An chéad rud a bhí uaidh ná tuiscint ní b’fhearr ar na cúiseanna ar fad a bhain leis an chliseadh eacnamaíochta. Bhunaigh sé grúpa de shaineolaithe chun an scéal a fhiosrú. Ansin gheall an tUachtarán nuathofa go mbeadh sé ina cheannaire láidir, éifeachtach. Chuaigh sé i gcumarsáid dhíreach leis an náisiúin ar an raidió. Thug sé sraith de chainteanna ar tugadh na ‘cainteanna cois tine’ orthu. Cainteanna díreacha, neamhfhormálta a bhí iontu seo trínar éirigh leis an uachtarán an pobal a spreagadh. Nuair a chlis ar na bainc, dhún Roosevelt iad agus thionóil sé an Congress chun seisiúin éigeandála. Faoi cheann seachtaine, bhí an leachtacht chuí curtha ar fáil ag an rialtas. Ansin sheol rialtas Roosevelt an New Deal, beartas nua a chuirfeadh an rialtas ar ais i gcroílár an gheilleagair. Cuireadh leas sóisialach, oibreacha poiblí, agus scéimeanna móra bonneagair ar siúl. Thug na Stáit Aontaithe eiseamláir eile dúinn ag tús na bliana, go dtagann ceannairí eisceachtúla chun tosaí ann in uair na cinniúna. Ní fios go fóill cé acu an éireoidh nó nach n-éireoidh le Barack Obama an tír a chur ar ais ar a seanléim, ach is cinnte gur ábhar maith ceannaireachta atá ann. Fós féin, táthar a rá go bhfuil Obama ag glacadh le Lincoln mar eiseamláir agus go bhfuil an t-eolas aige ar an cheannaireacht a thug Lincoln don tír in uair na cinniúna. Níor léirigh Brian Cowen fós gur ábhar dea-cheannaire atá ann. Is cosúil go bhfuil na bunbhuanna in easnamh air: cumas cumarsáide, tuiscint ar an phobal, fís don tír, intinn ghéar, agus misneach. D’éirigh le Roosevelt biseach a chur ar geilleagar na tíre. Thuig sé ón tús go mbeadh beartas cuimsitheach de dhíth agus go raibh athruithe bunúsacha de dhíth ar an chóras chaipitil. Thug sé ról lárnach don stát i riaradh gheilleagar na tíre. D’éirigh le Roosevelt de bharr gur thug sé an pobal leis. Chuir sé ina luí ar dhaoine cén cuidiú a bheadh de dhíth ón phobal féin agus cé hiad na spriocanna a bheadh i gceist chun feabhas a chur ar an gheilleagar.